Some Super Smash Bros. characters are equal, and some are more equal than others. Ever played Super Smash Bros. Brawl as the tournament-banned Meta Knight? Super Smash Bros. has never been perfect in his balancing. With more tweaks in the upcoming Super Smash Bros. for Wii U and 3DS, director Masahiro Sakurai plans to make certain moves stronger while adding exploitable weaknesses to them. "Doing things like simply 'lower the performance' can make games lose its fun," Sakurai said. "Additionally, making a strong attack weaker can take away from the 'good feeling.' By making adjustments that get rid of all advantages and disadvantages, it can turn a game into a mediocre one without any challenge." At the moment, Sakurai is working on character adjustment to Bowser. Mario's main antagonist is stronger than ever in the upcoming Super Smash Bros., and balancing his strengths with some inherent weaknesses is important. "Rather than directly weakening an attack's advantageous parts, we're putting effort into keeping them strong, while adding other weaknesses to them," Sakurai said. "Like giving the attacks punishable openings, or weakening the character's mobility or recovery rate. We're making comprehensive adjustments to characters, even for parts that might seem completely irrelevant." 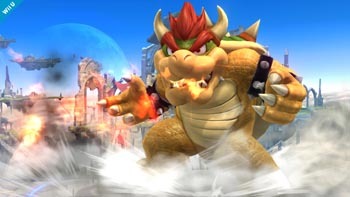 Bowser has stronger knockout moves and is more likely than before to send opponents flying through the air. He won't be the only one likely to punch characters out of the map. Sakurai mentioned sending characters out of the ring is a great deal of the fun in playing the game, so his team is putting more care into making attacks stronger without making them impossible for other players to handle. Sakurai noted that while balancing for Brawl began six years before its release, updates to the game never sought to reform the balancing. He hopes to release the new title "as soon as possible" and to make it "more enjoyable than ever."